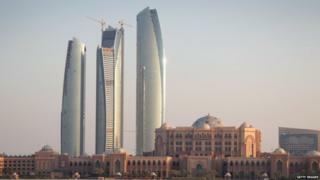 An Australian woman arrested in Abu Dhabi for cybercrime has now been deported. Jodi Magi said on Facebook that she had left the country after spending "53 hours in custody". Ms Magi was detained in July for what appeared to be a social media posting. Australian Foreign Affairs Minister Julie Bishop said on Tuesday Ms Magi was detained ahead of her planned deportation. The Australian government provided consular assistance to Ms Magi and her husband, and her plight was covered widely by local media. Ms Magi had told the Australian Broadcasting Corp. (ABC) she was arrested after sharing a photo on Facebook of what she thought was an illegally parked car. In the photo, she blacked out the number plate of the car, which was parked across two disabled parking spaces in front of her Abu Dhabi apartment. Ms Magi said on Wednesday on her Facebook page that she had been shackled and forced to sleep on a concrete floor during her incarceration. She said she knew she would never have been released so quickly if she had not been an Australian, had not received consular and other support, and if her story had not been covered by the media. Cybercrime laws enacted in the UAE in 2012 to crack down on dissent have been condemned by human rights groups. Ms Bishop told local media Australian travellers needed to adhere to the laws of the countries they visited. The Australian Department of Foreign Affairs' travel advice for the UAE warns that locals laws that appear harsh by Australian standards nevertheless apply to Australian travellers or residents. Ms Magi told the ABC she had no idea what she had done was wrong.